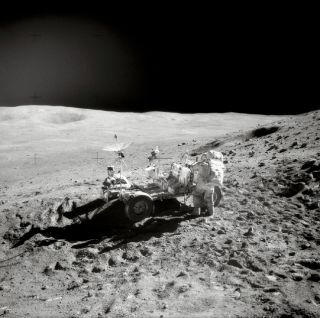 An astronaut places tools into the Lunar Roving Vehicle. In this historical photo from the U.S. space agency, Astronaut John W. Young, Commander of the Apollo 16 mission, replaces tools in the hand tool carrier at the aft end of the "Rover" Lunar Roving Vehicle (LRV) during the second Apollo 16 extravehicular activity (EVA-2) on Apr. 22, 1972 at the Descartes landing site. This photograph was taken by Astronaut Charles M. Duke Jr., Lunar Module pilot. Smokey Mountain, with the large Ravine crater on its flank, is in the left background. This view is looking Northeast.